Bitcoin and content marketing? Where’s the relationship? Blockchain. If you’ve heard of blockchain, it was likely in connection with Bitcoin. But blockchain is far more than simply the method of recording Bitcoin ownership. Let’s take a look at what blockchain is, and then how it relates to content marketing. Originally theorized in 1991, as a way to timestamp digital documents as they were created, blockchain ultimately provided a ledger of ownership and creation of digital assets. However, it wasn’t until 2009, with the advent of Bitcoin, that blockchain technology became popularized. In Bitcoin usage, blockchain provides a transparent and unalterable way of keeping track of who owns a given Bitcoin. Its name is derived from two parts: block and chain. When a transaction or asset creation is first created, it forms what is called a “block.” The block is then added to the “chain” and recorded in a ledger that is distributed across multiple locations. The block lives in the chain and is unalterable, and cannot be deleted. Because blockchain is decentralized there is no middleman that can alter it. It is inherently a more trustworth way of keeping track of transactions. How does blockchain relate to content marketing? 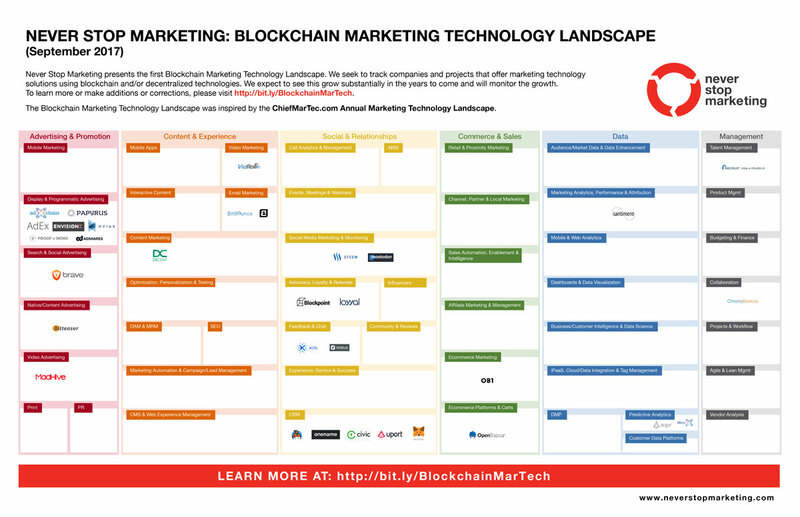 Blockchain is just starting to make inroads into the world of marketing, and several of it’s earliest applications are in content marketing. As I submit in the next section, talking about the problem of brand mistrust and how it affects content marketers, consumers are becoming more critical of marketing in general. Content marketing does not escape this critical consumer. With a need to increase trust in marketing, there are a dozen or so marketing technology solutions that have been created. You can see those in the below technology landscape graphic (click on the graphic for the full version). Most of the early entrants in this martech space are focused on proving the value of advertising networks, specifically proving that ads are being seen by actual consumers and that the ad networks are being effective in driving conversions. Fake news, fake online customer reviews, lack of trust in governments, business and brand mistrust… These are all problems that are starting to affect content marketers and brands in a direct way. Five years ago advocacy, review, and referral platforms were just coming into vogue as “trusted” sources for consumers that were evaluating a purchase. In the past few years, though, businesses have learned to drive just their happy customers to these platforms, or in some cases to drive fake reviews, in order to bolster up their ratings. Despite the efforts of these businesses to drive what appear to be authentic reviews, the falseness is evident and consumer trust has decreased considerably. With fake news taking over social media and with politicians pushing ethical boundaries so that they can win elections, consumer trust continues to erode. For content marketing professionals this decreasing trust is a considerable problem and one that will only increase in scale in the coming months and years. After hard work and non-trivial amounts of money to create good content, these content marketers then work hard at distributing their content on social media. In regards to decreasing consumer trust, social media is one of the hardest-hit distribution channels. The best solution for brand distrust would be a higher bar of ethics for marketers and leaders in business and politics. But let’s get real. As long as there is money to be made, or power to be gained, people will find a way to leverage marketing to it’s fullest extent. The skeptic in me believes that there is no viable way to solve this ethical dilemma. The realist in me sees us taking a different approach to solving the quandary of brand mistrust. As the blockchain industry is already starting to prove out, consumers expect trustworthy interactions, and will move towards transactional systems that can provide that. Thus, the blockchain industry is beginning to fill this consumer need, with technology that validates ad spending and online social and review platform trust. Below are several applications of where blockchain is already making inroads into content marketing. Content marketers, while often not the ones directly buying ads, are greatly affected by ad technology due to their content being distributed and advertised via ad technologies. Ad spending is one of the closest-watched metrics in a marketing department, and for good reason. Not only does ad spending draw away budget from other marketing efforts (such as content creation), but it is also one of the easiest budgets to lose to fraud. Juniper Research findings indicate that as much as 9% of ad spending is wasted on fraud – that equals $19 billion in 2018. 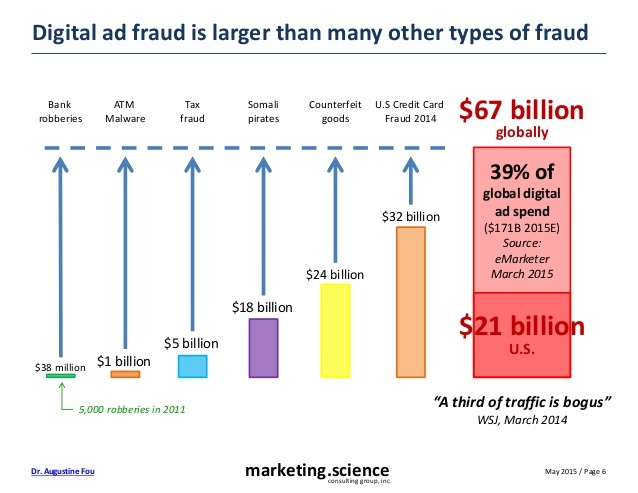 Research from the Marketing Science Consulting Group pegs the cost of ad fraud even higher, at $21 billion annually. Advertisers generally pay for impressions and clicks on their ads, and yet these are the two actions that are most easy to fake when it comes to ad technology. Small time “bad actors” can spoof impressions or clicks on their websites in order to generate more of an advertising revenue share for their website. Larger bad actors, such as hackers or foreign government-backed hackers, have systematic ways of garnering fake ad clicks and impressions in order to siphon off advertising dollars for their own malicious needs. In steps blockchain for advertising technology. Using a blockchain ledger, ad networks can more precisely share data on bad actors (and block them from the ad network), and more confidently ensure that the impressions and clicks they are getting are from legitimate consumers. Also, as many content marketers are already aware, when you buy ad placements you generally get to choose broad demographics of who you want your ads to be shown to and also can choose website placements by topic and categorization. However, are you confident your white paper is actually being shown to the individuals you want it to? With the ad networks owning all placement decisions you can’t be fully confident your digital assets are being shown to the right people. That is until blockchain enters the space as a way to track re-brokering of ads, placement of ads on sites, as well as demographic validation of ad viewers. If you’re interested in learning more about the early entrants to ad tech blockchain, I recommend you look at these ad tech companies, which are each innovating in their own ways: AdChain, AdEx Network, MadHive, and EnvisionX. Influencer marketing, a key component to creating and distributing viral content, has been a difficult realm in which to work. How do you find influencers? Are they really as popular as they claim to be? Are their followers legitimate? How much should you pay them? One company is leveraging blockchain to solve those influencer marketing problems, by adding transparency to influencer followings and decreasing the contractual friction of hiring an influencer. That company is SocialMedia.Market, a company pioneering influencer marketing with a decentralized marketplace for connecting social media influencers with advertisers. A good content marketer knows that there is a recipe for a successful piece of content. However, they also know that one of the largest and most frustrating ingredients in whether or not content goes viral is a strong dose of luck. If your content happens to get in front of the right person and get promoted by them, it will take off. Mavin is a blockchain technology that is building a way for you to decrease the amount of luck in that promotional transaction. 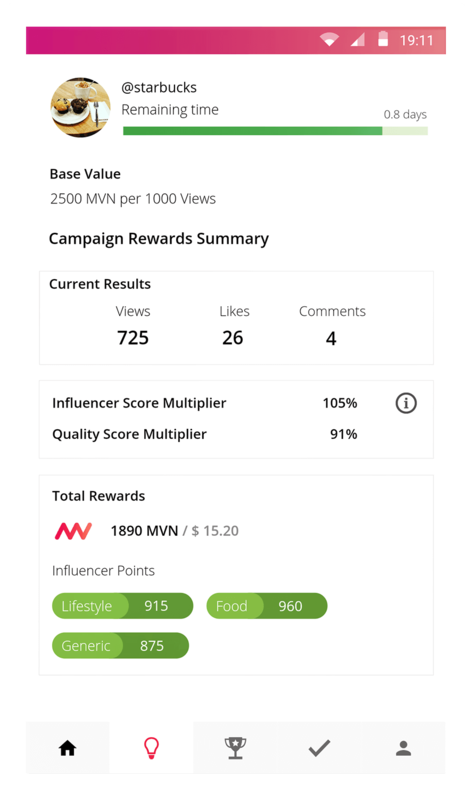 With Mavin, you can build a reward system for micro-influencers to gain credit when promoting a post. All the micro-influencer needs to do is like, favorite, or heart a post and then they’ll get a micro-reward from your brand for doing so. By leveraging blockchain technology Mavin guarantees that you’ll have higher quality promotions, will only pay for the true influence you’re getting, and pay less in middleman fees. Like many of the blockchain technologies, Mavin is still being built and is not going to be available until later this year. They are, however, aiming for a July pre-release to invite-only businesses. If you’d like to be considered for the early invite, you should sign up for their newsletter at the bottom of their homepage. When is blockchain going to revolutionize content marketing? While blockchain is already starting to influence content marketing, it is likely still a few years out before it begins to truly revolutionize the space. There are still several obvious improvements that could be made to content marketing technology that haven’t been realized yet and haven’t even started to be developed yet. For example, you could use blockchain to validate customer reviews online. Additionally, you could use blockchain to better crack down on fake news.